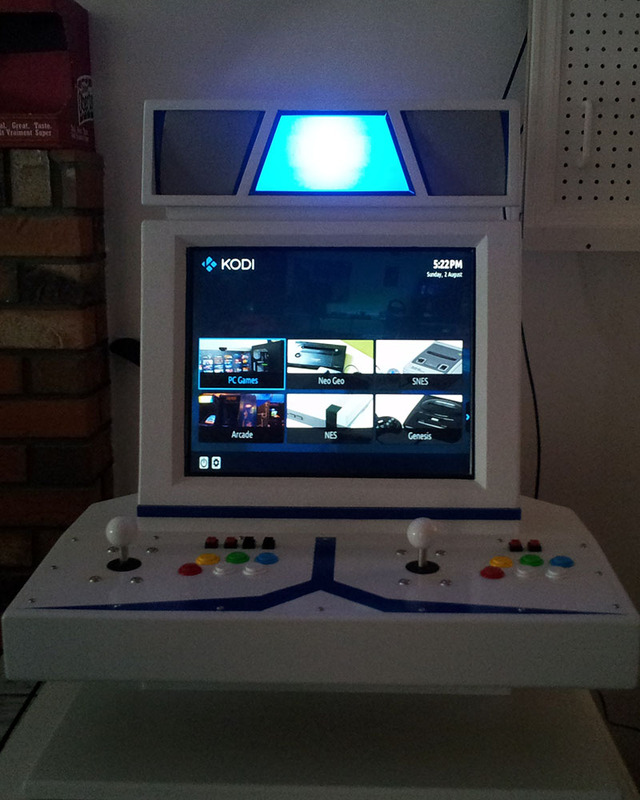 Candytop is a bartop arcade machine (MAME cab) loosely styled after a Japanese candy cab. The monitor is a 17″ LCD, and the whole machine is about 19″ wide. Because the control panel is wider than the cab itself, two players can play comfortably. It’s not perfect, but it’s fun to play and it’s impressed a lot of people who’ve seen it in person. The machine was built in the summer of 2010 and upgraded in July 2015. The controls are Japanese parts built by Seimitsu. These are laid out in a sort of compromise pattern that’s primarily meant for 6-button Capcom fighters and 4-button Neo Geo games, but works well enough for old consoles as well. The actual colour of the controls is the same as the Neo Geo plus two white buttons. The control panel is a bit unconventional- it’s actually a piece of 1/8″ hardboard. It’s thin enough and strong enough to mount the Japanese controls, which were meant for metal control panels. Internally, the controls are wired to generic USB controllers, which was a cheap but labour-intensive and not terribly compatible option. 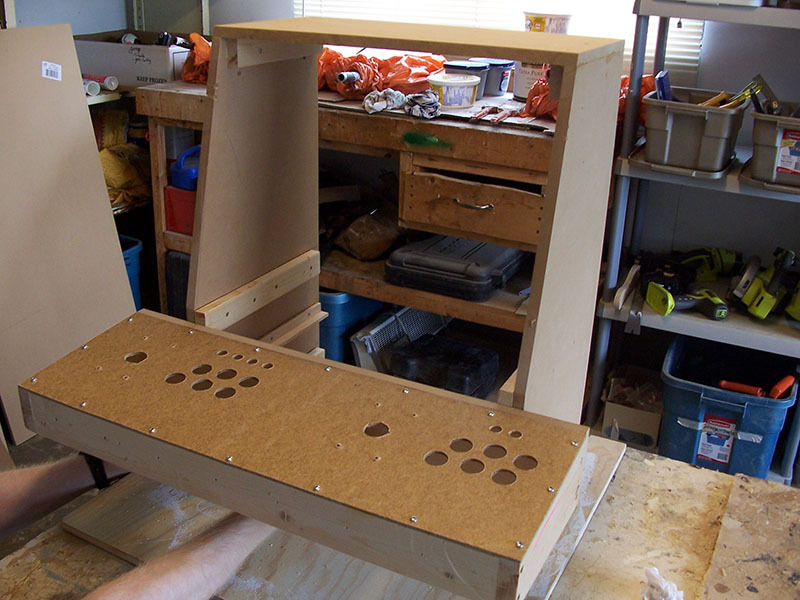 The cab itself is built from a mix of plywood and MDF. It’s very sturdy and can actually be carried by the hollow “wings”. The base is made of 3/4″ MDF and is very heavy- that’s what keeps the machine stable. My father did most of the actual woodwork- that’s not something I’m good at. I did the software and electronics. The paint is a slightly bluish white; it’s high-quality wood paint. The stripes and control panel were done with spray paint. The marquee is laser-engraved acrylic lit by a blue CFL. To be honest, it’s the area of the cab I’m least happy with. The speakers are from an old Seanix set that I think was built by Altec Lansing. They’re not the greatest but they get loud enough for an arcade cab. The area under the control panel is a removable panel held on magnetically. Originally, a small wired keyboard and mouse were housed inside, but this was changed to a Logitech k400r during the 2015 upgrade. 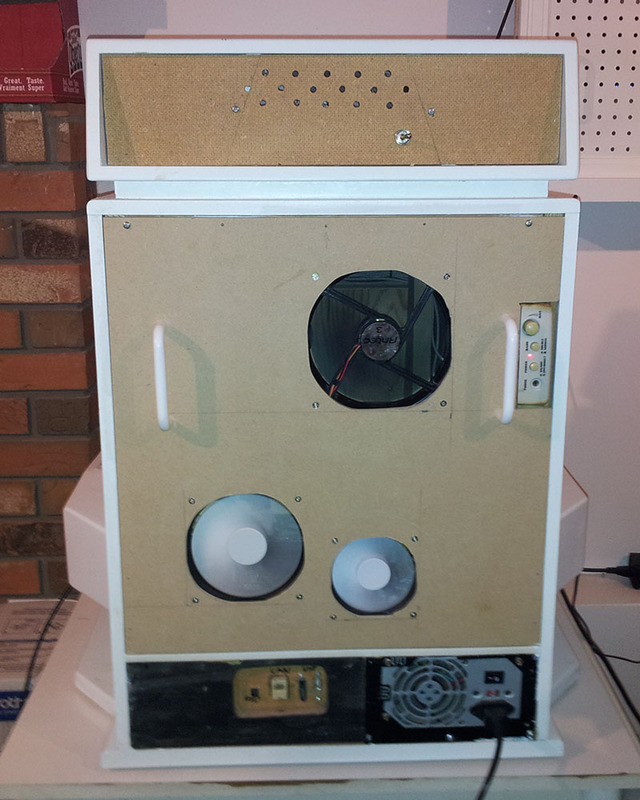 The back is a thin hardboard panel with intake and exhaust fans mounted on it to keep the machine cool. 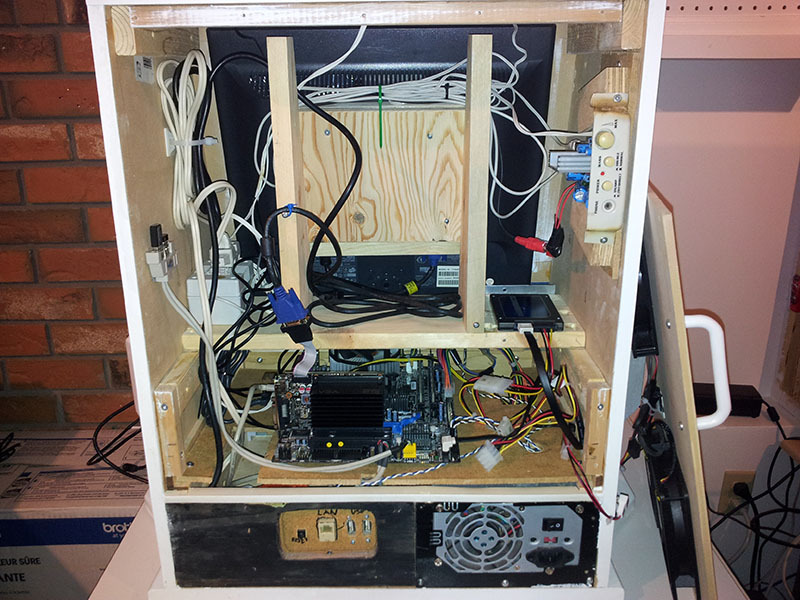 As built, it was powered by an Athlon XP 2600+ computer running Windows XP and couldn’t do much other than emulating old games. In that configuration, it used GameEX as a frontend. It has since been upgraded to a Core 2 Duo machine running Windows 7 with Kodi as a frontend, which is much faster and can run Street Fighter 4. You can read up on the upgrade and new specs here.